Joyce Jones, producer and host of “Suga’ In My Bowl,” was introduced to volunteering with WBAI radio by answering the phones in the Tally Room during the membership drives. 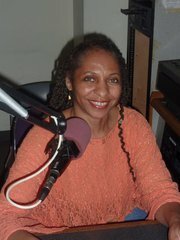 Before Joyce was granted this monthly music special, she had to learn how to operate the board, gather and edit sound from protests and varying community events that would be contributed to the WBAI Sunday Evening News and the morning news program “Wake Up Call,” as well as provide and pitch premiums for the membership drives. The first music special was on September 5, 2004, when Tony Ryan allowed Joyce to present a special on producer/arranger/composer Charles Stepney during the “Soul Central Station” time slot. In 2007, Joyce was granted a more regular monthly slot under the title of “Suga’ In My Bowl” (a name that was suggested by a friend named Andrew), where it’s been an honor to feature artists such as Nancy Wilson, Lou Donaldson, Patti Austin, Wayne Shorter, Freddie Hubbard, Yusef Lateef and many others. Joyce has hosted and provided many of the artists for the live performance segments during WBAI’s International Working Women’s Day programming, which airs every March 8. She has also contributed segments for WBAI’s “Hip Hop Takeover”.